One of my favorite restaurants in San Francisco is One Market. All of their food is good, but it's one menu item that I keep coming back for: chickpea fries. I just love them, what can I say? We had lunch at Ubuntu in Napa last month, and guess what was on the menu? Of course I had order them, and it was about that time when I remembered I had a recipe for chickpea fries in Mark Bittman's How to Cook Everything Vegetarian book. So I set off to find some chickpea flour to recreate one of my favorite restaurant dishes at home. I had a hard time finding chickpea flour - I tried a couple of stores, and ended up finding it in the bulk bins at Whole Foods. This recipe is actually quite simple, I can't believe I didn't try it sooner. I adapted the recipe by adding smoked paprika and a pinch of cayenne. The verdict: these chickpea fries are at least as good as what I order in restaurants. My husband thinks they're better. 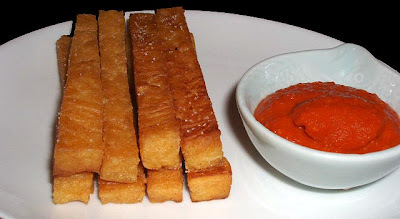 At One Market, they serve their chickpea fries with harissa aioli; at Ubuntu it's romesco sauce. I had some romesco sauce in the freezer already, so I went with that. Line an 8x8 square pan with parchment or plastic wrap, set aside. Bring 2 cups of water to boil in a medium sized pot. Gradually add the chickpea flour, whisking constantly to avoid lumps. Turn the heat down to low and whisk in a teaspoon of kosher salt along with the pepper, smoked paprika, cayenne and olive oil. Cook for one more minute, stirring constantly. Spread the chickpea mixture into an even layer in the pan. Let cool for about 15 minutes, then cover loosely. Refrigerate for at least one hour, and up to a day. Heat about 1/8 inch of oil in a large skillet over medium heat. In the meantime, lift the chickpea mixture out of the pan by the edges of the parchment. Cut the chickpea mixture into fries that are about 4 inches long by 1/2 inch wide. Place batches of the fries into the hot oil, turning when browned. After all sides have browned, remove from the oil and drain on paper towels, sprinkle with salt. Repeat with remaining chickpea fries. Serve with romesco sauce, tomato sauce, or aioli. Your chickpea fries look so incredible Sara! They look perfectly symmetrical and golden brown. I would love to try these fries! I am so fond of this, and I'll be making it. I have chickpeas flour in hand. These sound absolutely delicious! I have not yet been to One Market, but now I must go! Thanks for sharing this yummy-looking treat! How utterly perfect they look. My God, you are so very talented. This whole post was very intriguing to read. Thanks! What a cool idea! I need to find me some chickpea flour so I can try these out! Those chickpea fries are incredible - I've never tasted anything like that - I will pay Whole Foods a visit to get some of that chickpea flour! I've never heard of chickpea fries - they look incredible. Oh my gosh, your fries look so fabulous! Ive never heard of chickpea fries before, thanks so much for writing about it, I'm book marking to try. Your chickpeas fritters look so fab! What a great idea! Now those are some smart fritters Sara. We get so much chickpea flour out here, it's not funny! Thanks for a great idea!! Oh, I love this speciality! Your fries look fantastic! These look and sound perfect. I didn't know there was a such thing as chickpea flour. i roast chickpeas all of the time. How wonderful this is Sarah! They look great! Is your romesco sauce homemade? I'm trying to find a good recipe. sara, I can't tell you enough how much I've been wanting to try these. I saw them a few years ago and was trying find a decent recipe. thanks for sharing this! I can't wait! Cathy - I use the romesco sauce recipe from Tapas by Jose Andres. I usually make a double batch and freeze it in smaller portions. I'd be happy to copy the recipe for you, just send me an email. I love chickpeas!! And I have some flour. They looks so good. I have to try them! Girl those look amazing, I have never heard of Chickpea Fries in my life! This is really cool! It's the first time I see it actually, I'm sure I'd love them! This is so different. You did really good, they look great. Wow, that's a really cool idea! I see chickpea flour around here every so often. I made cakes out of it for a friend who can't have wheat and they tasted...strange...But this sounds like a way better use for it. Those chickpea fries look good! I love chickpeas!! I've never used chickpea flour before, what a great way to enjoy chickpeas! You know, I have not tried these, but they really sound good! I may give them a whirl! I have the same book :) It's sitting in my cubicle at work. I've made a few things from it, but usually just feel overwhelmed deciding which recipe to pick! Oh wow, Sara. Those look AMAZING. Seriously - like they came straight out a fancy schmancy swanky restaurant kitchen! Do you deliver to LA? I will have to look for chickpea flour. It's amazing what you can find in the bulk bins at whole foods. I love the bulk gummi bear like candy. These look so perfectly shaped, and healthy (more fiber) to boot! Chickpea flour is also known as Gram or Garam flour in Indian grocers, or in the ethnic part of your supermarket. Did you have a recipe for the romanesco sauce on your blog? I have never had chickpea fries, but these sound amazing! These sound great! I love that you added paprika and cayenne. I have to try these. I can't find chickpea flour either although thanks for mentioning that Whole Foods has it. Next time we go to Atlanta, I'll see if they have it there. I've been dying to make Socca - it's a little chickpea cake that is street food in Nice, France. Very tasty with cumin, coriander and thyme. We first tried it when we visited friends in France and they took us to the wonderful fresh markets there. If you want, I'll send you the recipe. It looks quick and easy. These look fantastic. And gluten-free is a good thing, too. I've seen chickpea flour many times at the grocery and hadn't any clue what I would do with it--until now. I have never tried these but they look scrummilicious. Oh this is so right up my gluten free alley, I bought every kind of flour under the sun last week, and have been playing with mostly blue corn and quinoa flour, so this is next, YUM! I dunked them into dukkah. While the beau didn't care for them, I liked flavour and texture, and the way they paired with the dukkah! I had chick pea fries for the first time at Cafe Bolud in Palm Beach and have been searching for a recipe ever since! Thank you.